“John was above all a man with a code. 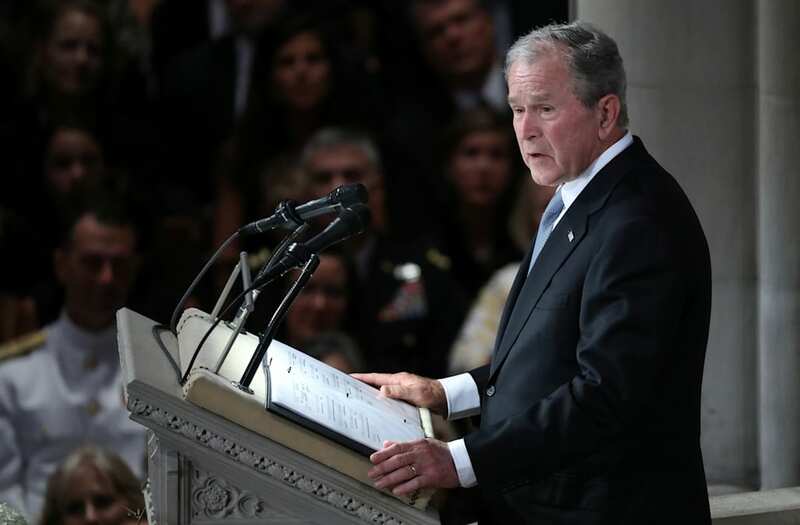 He lived by a set of public virtues that brought strength and purpose to his life and to his country,” the 43rd president said during a memorial service at the National Cathedral in Washington. “He was courageous, with a courage that frightened his captors and inspired his countrymen. He was honest, no matter who it offended ― presidents were not spared,” he said, drawing laughs. President Donald Trump ― who appeared to be a target of many of the service’s eulogies ― clashed with McCain during his presidency and did not attend the service. Bush, who successfully ran against McCain for the White House in 2000, emphasized that it was the Vietnam veteran’s loyalty to his country and respect to his fellow human being, whether it’s friend or foe, that made him so great. Bush concluded his speech by stating that though the senator “has moved on,” his legacy will continue.